Making goat cheese originates from Eastern Mediterranean many thousands of years ago. It then moved into Spain and France, where chèvre is a staple in the diet. It has been said that goats were among the first domesticated animals, and thus using their milk as an ingredient in the art of cheese making has been around for centuries. 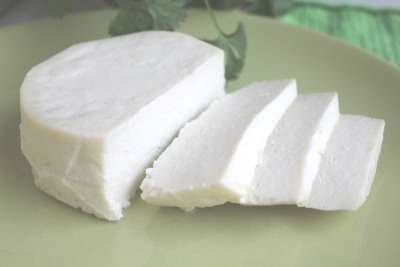 Goat cheese is a delicious addition for stuffed pork or chicken, crumbled over asparagus, zucchini, fresh greens or asparagus, as a pizza topping, or in stuffed peppers, or as a ham and chèvre omelette. These are just some ideas. I developed a passion for goat cheese some years ago, and now I absolutely love it! And goat's cheese is actually quite simple to make. It doesn't require a lot of "special cheese making ingredients." In fact, you will have everything you need in your home. Some recipes will use white vinegar or rennet, but this recipe uses lemon juice. If you would like to add garlic, onions, chives, or other herbs to your cheese, that is possible as well: the sky's the limit! Add goat's milk to stainless steel pot or oven. Slowly heat the milk until it reaches a temperature of 85°C/185°F. Do not scorch the milk. If you see small bubbles on the surface, you are probably close to the required temperature. Add lemon juice to goat's milk. Allow milk to rest for approximately 10 minutes. It should curdle during this time. Meanwhile, line the strainer with 2 layers of cheese cloth or muslin. You can slightly dampen the cloth so that it easily adheres to the colander. Place into the sink. Gently pour the milk into the cloth. Allow to drain for 5 minutes. Then gather the edges of the cloth up around the cheese. Tie the cloth together (or use a rubber band) and allow it to hang, draining for up to 6 hours. More whey will be removed from the curds if you let them hang for a longer period of time. Also, with less fluid in the cheese, it is easier to form or shape later on. Hang the bundle over a pot or bowl to drip. When finished, squeeze any remaining whey out of the curds; open up cloth and scrape cheese into another clean bowl. Add salt, to taste (remember: the cheese is tangy), and stir to combine. If you want to add minced garlic, chopped onions or chives or other herbs, do so at this point. Using clean hands, shape the cheese into a log, or put into a mold. You can also use a cookie cutter to shape the cheese. If you wish, you can roll the chèvre in chopped nuts, herbs or cracked, coloured peppercorns as well to enhance the flavour. Refrigerate for at least 1 to 2 hours for the flavours to meld together. If refrigerated, goat cheese should stay fresh up for up to 1 week. As you can see, making goat cheese isn't hard at all. So embark on the adventure!